Oh, a soft soggy day there, huh? There's a nice song by Kitty Kallen, "Little Things Mean A Lot". And it would probably go with just such a day. Enjoy a good cuppa. so delicate! Very nice photo. BEAUTIFUL! It looks like a licked lollypop!!! Oh, I forgot to say this pic is now on my slideshow screensaver. (it's a private computer- I respect your copyright) Since I discovered how to work the program (Ü) I've been collecting pics from various sources. I mix them with family pics and I decided to change out the flora ones to represent the seasons. This pic is such a lovely one for Fall. Great eye, Susan. Oooh Susan that's a peach of a picture! 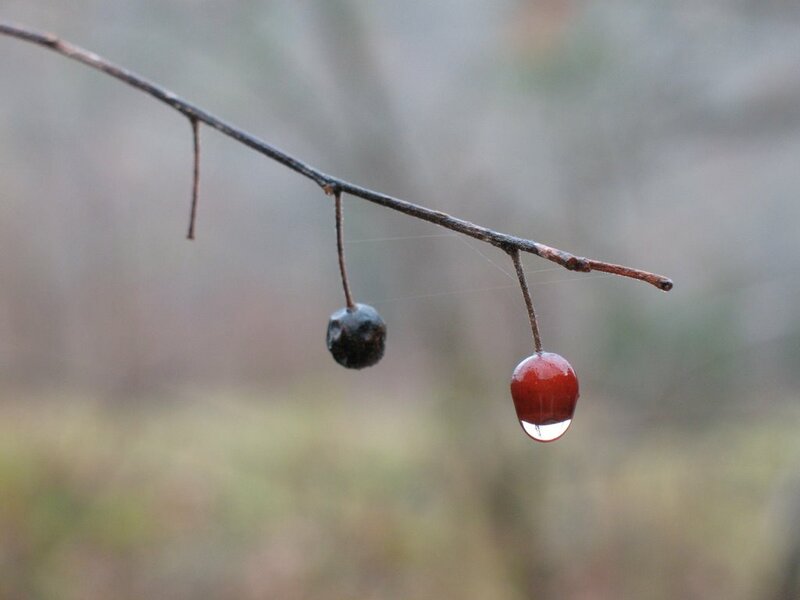 Can you see your reflection in the red berry? That picture totally sums up the season - well done. When you click to enlarge it, you can see tiny spider silks. This photo should be entered into contests! What a perfectly lovely picture. I do believe in the "little things."